Don’t say I didn’t warn you. Because I totally did on Facebook. I even gave you a 10+ hour head start to mentally prepare, pray for your sanity, take a few laps.. what have you. This cake, though — it is insanity, people. So a couple days ago I was doing my usual social networking and wanted to share something chocolate-y. I quickly realized that I have been the worst food blogger in the world because I have a surprising lack of chocolate-y things on my blog. HOW COULD I DO THIS TO YOU!? Why did no one ever say anything about this clearly abusive relationship? How can I call myself a dessert blogger and not even post chocolate stuff? WHO AM I?! So after having a brief existential crisis, I got my booty in the kitchen and whipped up a ton of chocolate-y lovelies for you because you deserve it after all of this blatant neglect. I hope you can find it in your chocolate heart to forgive me, shnookums. One of the most chocolate-y things I can think of is chocolate cake. No matter how you slice it, it’s always super rich, super decadent and a super quick way to squelch any chocoholic cravings. I knew I wanted to whip up a chocolate cake for y’all but with a fun twist. Making a giant Oreo cake was kind of a no-brainer! If you’re an Oreo fan you’ll FLIP for this cake! 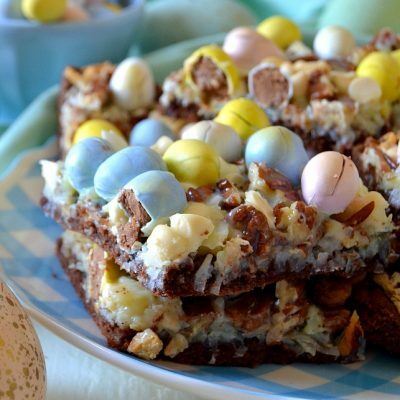 Super moist, sweet but not cloyingly so, and smothered in lots of cookies and CHOCOLATE, it’s sure to cure that craving and then some. We’ll be back in love in no time. Chocolate lovers, rejoice! This ultimate Oreo Overload Cake is for YOU. Smothered with Oreos in the batter, frosting and the topping, it's sure to cure any chocolate cookie cravings. Preheat your oven to 350 degrees F. Liberally grease two 9" cake pans with cooking spray and set aside. Prepare the cake batter according to package directions; stir the entire box of dry pudding mix into the cake batter and stir to incorporate. Pour the cake batter evenly among both baking pans and bake for approx. 15-20 minutes, or until a toothpick inserted near the center comes out mostly clean. Allow the cakes to cool in the pan for about 20 minutes before gently inverting them onto wire racks to cool completely. In a large bowl, beat together the cream cheese, sugar and vanilla until smooth and creamy. Gently fold in the Cool Whip to combine. Lastly, gently fold in TEN finely chopped Oreo cookies -- you want smaller chunks for this. On a cake plate or serving platter, place one cake flat-side facing up. Spread the Oreo filling mixture generously on top of the cake, extending the filling toward the edges of the cake. There will be a lot of filling, but that's what you want! Take the remaining cake half and place it, flat-side down, on top of the filling to make the "sandwich." Allow the cake to sit for about 15 minutes. Meanwhile, chop up the remaining 10 Oreo cookies into coarse chunks; set aside. Microwave the unwrapped (remove the lid AND foil!) can of frosting for about 20 seconds or until thick but pourable. When my family came home from work & school, they took one look at the cake and gave me a pleading look. “Can we please have a slice? !” they asked as if they hadn’t eaten in weeks. And within minutes — seriously, they blazed through dinner without tasting a single morsel I’d imagine — the cake was devoured. It’s truly a cake for an Oreo lover — the Oreo flavor and texture is prominent throughout the entire cake, from the moist, tender crumb of the chocolate cake, to the creamy, sweet frosting studded with crumbled cookies, to the fudgy, rich topping, smothered in chopped cookies. You’ll love it!! OH MY HEAVENS! That looks amazing! I am so going to try this, but only when I know others will be nearby because my doctor would kill me if the insulin overload doesn’t! Sometimes, I really dislike being diabetic! TracyEllen, dang diabetes! Yes, have others nearby as moral support and to catch you when you inevitably faint at the amazing taste of the cake 😉 thanks, girlie!! My bday is at the end of the month and I’ve been thinking of what to make for myself. THis may be it if I can wait. I’m not sure I can. This looks outrageously delicious! Ok, I’m going to be honest here… I never really read a recipe when I see Oreos involved. Don’t ask me why, it just never really appeals to me. Don’t get me wrong…I’m a true Oreo fan, I think I just prefer to eat my doublestuffs with a tall glass of milk. That is, until five minutes ago. And then… HOLY SMOKES MAN!! I want this cake. I NEED this cake. It’s beautiful. I know that it’s going to be that “close your eyes and savor the moment” as soon as I take my very first bite, type of cake. 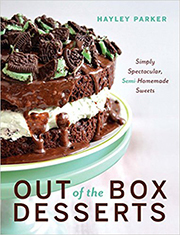 I’m truly impressed with this, and now I need to have an Oreo cake party this weekend. OMG!!! I’ve been waiting to see this cake and now it’s made my day! The only thing better would be to have it in front me! WOAH! OMG this is INSANE! Sooooo much deliciousity happening up in here! Totally pinning this magical treat for later! So much amazingness in one cake! I am head over heels in love with anything involving cookies and cream. YUMMY! I’m really mad at you about this cake. Oh, man. Can’t WAIT to make this! Seriously!? I can alllllmost imagine what it tastes like. This looks amazing. Come one?!?! Amazing….Out of words amazing! Loving the Oreo overload! We can never get enough Oreos in this household! Whoa! This looks *beyond*!!! All that keeps coming out of my mouth is nom nom nom! Oh my lawd!! Why is this not in front of me right now??? Seriously in love with this!!! The title is right up my alley! Don’t think I could ever get too many Oreos. And your pictures are gorgeous, Hayley!! I am so in love with Oreos and this cake! Oreo heaven! Oh goodness, YES YES YES. Just going to dive in and live in this cake. And then be homeless because I will eat my home, but it’ll be worth it! 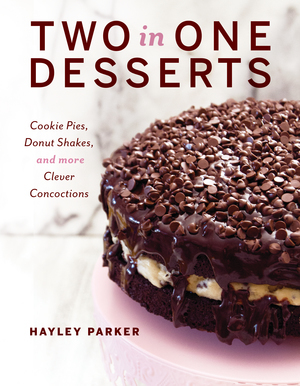 Dude, you are forever forgiven for the lack of chocolate posts (which I never noticed because, well, who complains when cookie dough bombs show up in your reader…) because this cake is BANGIN’ ! I sort of just want to shove my face right into it. Weird, but true. Phenomenal cake, girl! I’m loving your Oreo frenzy of late. Pinned! Wow, this looks so good! Would it ruin the filling if I made the cake the day before, refrigerated it & added the melted frosting & crushed Oreos just before serving? Can you make this the day before and put it in the fridge covered? Would it still be as good? Yes, as long as it was covered, it’d be great! This cake is amazing! Every time I make it, I get rave reviews. Thank you! !